Robert Dawes Carrithers – known on campus as “Jim” – was from Toledo, Ohio and the son of a Wabash man. He entered Wabash in the fall of 1941 and pledged the Phi Delta Theta house, as had his father. He was involved with many activities on campus – the news bureau, the Sphinx Club and also played football. 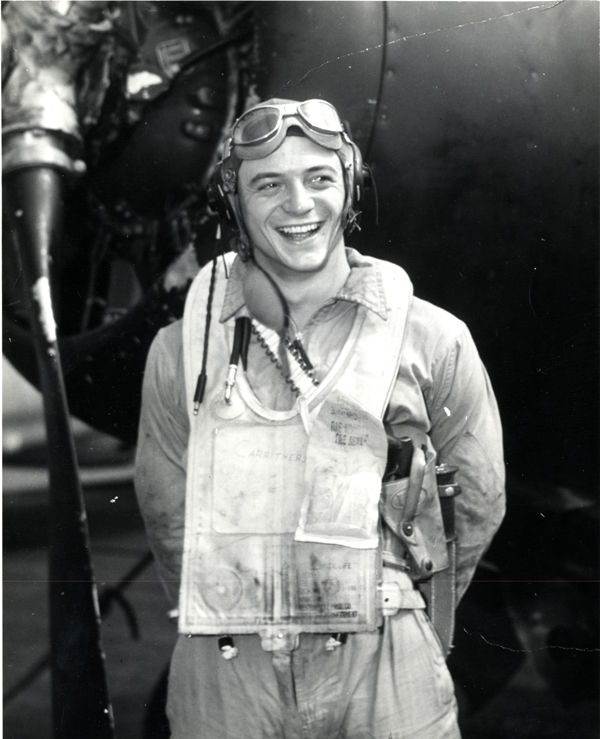 By late February of 1943 he had withdrawn from Wabash and was on his way to active duty with the Naval Air Corps. After the war, Carrithers returned to Wabash, completed his degree and, like so many millions of other veterans, went to work, first in Chicago then at Boeing where he was an industrial engineer for many years. Carrithers died at the age of 59 in 1983. He was much admired in his community where he played an active role as commissioner. So while looking for Civil War veterans I also found this World War II veteran’s photograph. A great picture and a great story too!